5 pre-made layouts and more than 50+ elements that you can use right away! What is Renova UI Kit Template? Renova is a modern and good looking set of 5 pre-made layouts with more than 50+ useful sections divided in 13 categories that you can easily use and edit. The perfect fit for creatives or digital agencies that are looking for set of web assets that they can use right away. This template includes 5 solid main pages that you can use for your Website, each one of them contains distinctive elements that makes each layout unique. Here is a list of the13 categories we have included in Renova template, use them as you want and create virtually unlimited designs! Nedeless to say that this template is fully responsive and will look crisp and sharp on any mobile device. Its CMS functionality will allow you to add new works to your portfolio as well as have your own managed blog. On screen editing will allow you to make any update to the content in a few minutes. This templates comes with fast and friendly support! If you still have questions please contact us. 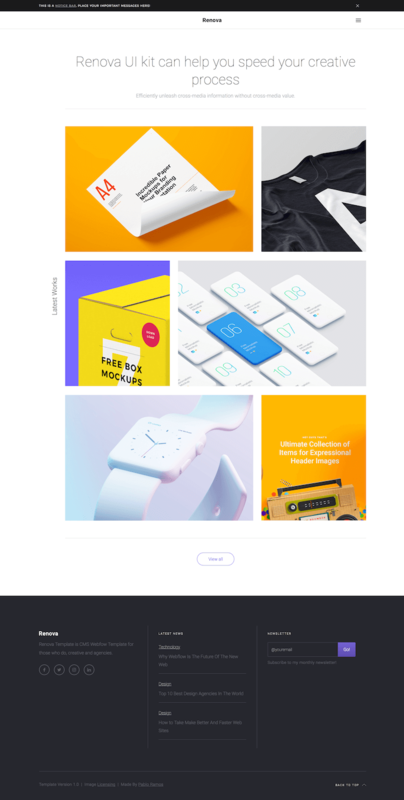 Renova UI Kit Template is only available on Webflow. Don't forget you are getting 5 different main pages, with more than 50+ elements for the price of one design, please contact us in case you have any questions about your purchase.